It’s the holidays and you have a house to sell. Isn’t it best just to wait until after the new year before putting it on the market? 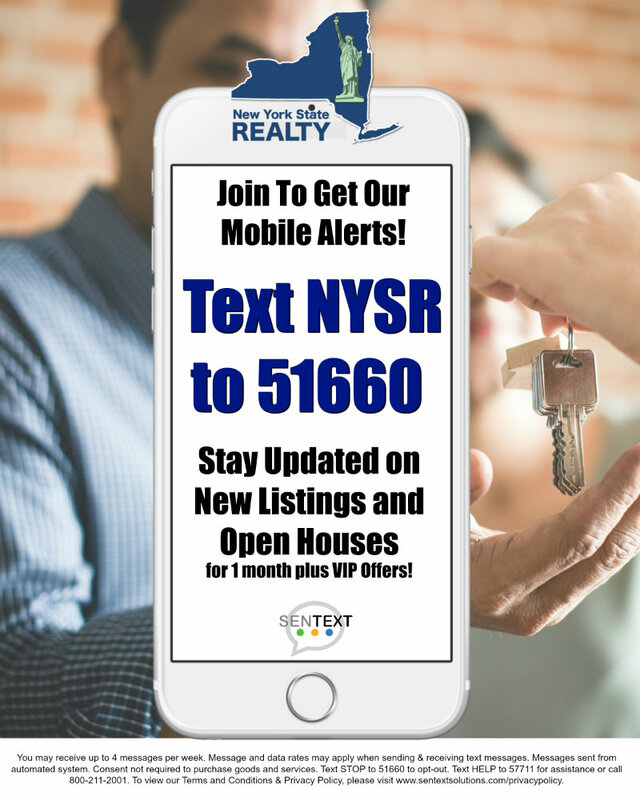 Not as far as New York State Realty is concerned. Here are 11 good reasons why you should list your home during the holiday season. Although the holiday season is a hectic time to show and sell your house, there are distinct advantages to staging and showing your home during the holidays—you have a chance to show your home at its very best, adorned with warmth and cheer sure to charm. Nothing is more inviting than a home brimming with greenery, twinkling lights and holiday decorations. Curb appeal. First impressions are important. If you live in a snowy area, make sure walkways are cleared. Or if late fall leaves are littering the ground, be sure to clear them away. Also make sure the path to the stairs is free from ice. A few exterior holiday lights or decorations shows pride in ownership and seasonal cheer, but keep in mind that while exterior lights are beautiful at night, they don't add anything during the day when potential homebuyers will be looking at your home, so you don't want to overdo it. Another thing to consider: would-be buyers may view it favorably if the homes are brimming with lights—it shows unity and neighborliness—so you'll want to find a tasteful balance. Trim outdoor trees so unexpected winds don't knock down branches that could damage your home or hurt anybody. Place a nice welcome holiday mat outside your front door. Make sure your door area is clear from bicycles, toys or parcels left by the mail carrier. Keep the house cozy. Entering a cold house could leave a lasting chilling impression. Instead, set the thermostat at a comfortable temperature. A toasty fire. If you're only stepping out while an agent is showing your house, start a fire in the fireplace. Nothing says home more than a nice cozy fire. But never leave a fire unattended. Your tree. This year you'll need to think about your tree more than you usually do. For starters, if your house is on the small side, get a smaller tree. You don't want the tree to appear to take over the entire living or family room. Likewise, you don't want to cram too much furniture into a room just to get the tree to fit. Remove furniture if necessary. Keep decorations on the conservative side. Not all home shoppers may celebrate the holidays in the manner you do. You don't want to overwhelm anybody with abundant displays of holiday cheer. You want your house to be noticed, not your decorations. If your house is being viewed in the evening, let your agent know which tree and other holiday lights should be turned on. And be sure the agent turns the lights off or you have a plan to be home immediately following the showing. Bake holiday cookies and treats often. The enticing smell will be welcome to those viewing your house. Be especially careful about ensuring your home security system is turned back on after agents show your house, especially if you have gifts under the tree. Windows. Make sure your windows are sparkling clean. Let the light in. Open blinds and curtains and turn on interior lights to reduce the dreary lighting that pervades in the dark winter months. Leave some holiday treats and hot chocolate for your guests. Finally, keep in mind that the holiday adornments should accent—not dominate—the house. You want to convey the love, comfort, and joy your family has shared in the house. If conveyed successfully, a new family will be anxious to move in and carve out their own holiday memories. Why Put Your House on the Market During the Holidays? A well-decorated home is enticing to buyers during the holidays. With all of the chaos between now and New Year's, it seems it would be madness indeed to put a house for sale during the winter. But smart Realtors say it may just be the perfect time to put up the "for sale" sign. One house-hunter turned real estate agent, who remembers she and her husband were transferred every couple of years and always right before the holidays. "I have many fond memories of how beautiful the houses looked all decorated with lights and holiday garland," she recalled. "Many of the homes smelled of cinnamon and spices. All of my senses were in overdrive and I couldn’t wait to purchase a new home and lay down roots once again." Now settled in the midwest in Naperville, Ill., she has resumed her real estate career and shakes her head in amazement when she watches her associates take their clients' homes off the market when winter rolls around. "It's my experience, both personal and professional, that buyers who are looking at homes during this time of year are serious buyers indeed," she said. "I have watched homes sell right before Christmas. In fact, a few years back, one of my clients sold their home on New Year's Eve with the buyers signing a contract right there on the spot." Los Angeles Realtor Lee Dworshak concurs. "Experience tells us that only the truly motivated home buyers and sellers are the ones who will be out there over the holiday season. While most folks close their doors just before Thanksgiving and don’t open them again until mid January, the folks that are willing to give of their time and perform the due diligence required during this period are really serious about buying or selling." Kathy Keating, a Realtor in Boulder, Colo., believes there's always a buyer or a seller even during the holiday season so she doesn't enter into this time of year thinking it's going to be challenging. Her advice? Make is as easy as possible to have a showing. Don't decline showings and don't put time limits on them. "It's a numbers game," she says. "The more people you get in the door, the better chance of selling your home. And it only takes one buyer. As far as a seller, the inventory is at its lowest right now and people are getting nervous and either renting their homes or just taking them off the market. People would like to see new homes." Karlene Smith, a Realtor in Warren, Penn., finds that families often come back to where they grew up during the holiday season. "And if they're thinking of making a move back, now is the time they will be looking," she said. She agrees that those looking for homes are serious buyers but she cautions real estate agents make sure potential buyers are pre-approved. "You do not want to put the sellers and their families out in the cold and snow for a showing unless the buyer is capable of purchasing," she said. And she has one very practical tip for showing a house during the holidays. "Since we are in the north we also have to deal with mud and snow during this time, one issue is the men wear work boots that lace up and taking them off to a view a home can be an inconvenience. What I suggest is buy the disposable booties that doctors wear in surgery. They are great for slipping over the boots keeping the sellers floors from damage."